I’m in the middle of laminating my Valentine’s Day activities, but in my down time (wait, what’s that again) I have made the second of my St. Patrick’s Day activities! I asked you what you needed added on Facebook. 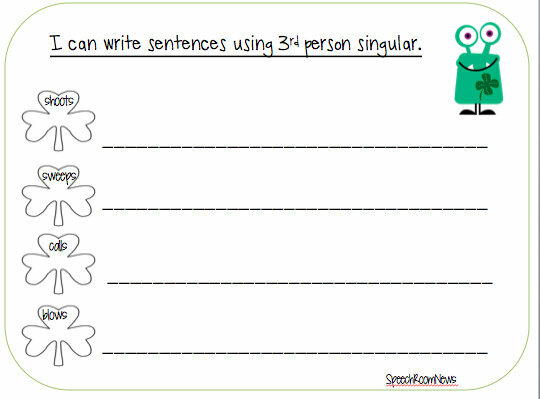 I heard you and added 3rd person singular activities! What else is new HOMEWORK SHEETS! 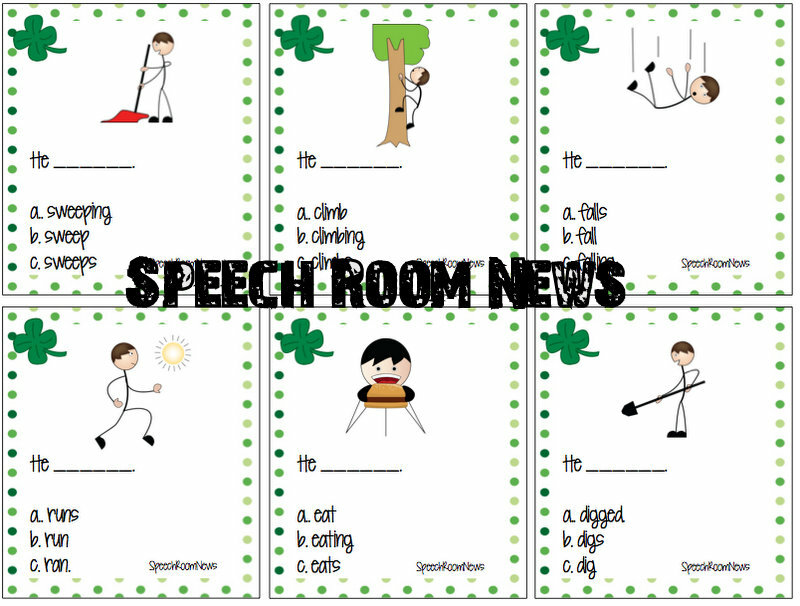 Or use them as recording sheets during the activities! No doubt, that even though I have these packets done right now, I’ll be furiously laminating them on February 28 trying to get them ready for the beginning of March. 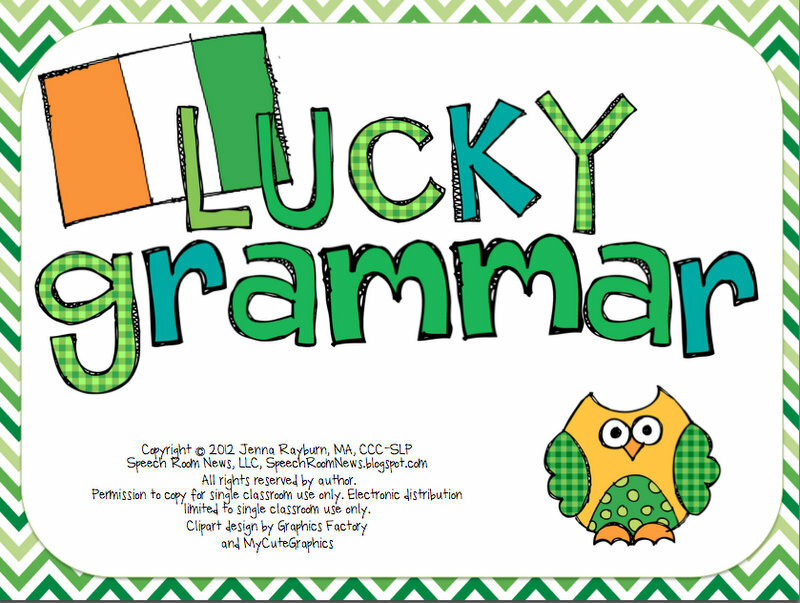 Lucky Grammar . The packet includes 7 different small group activities. 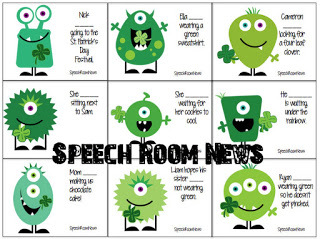 Perfect for speech therapy or literacy groups, with a St. Patrick’s Day theme! 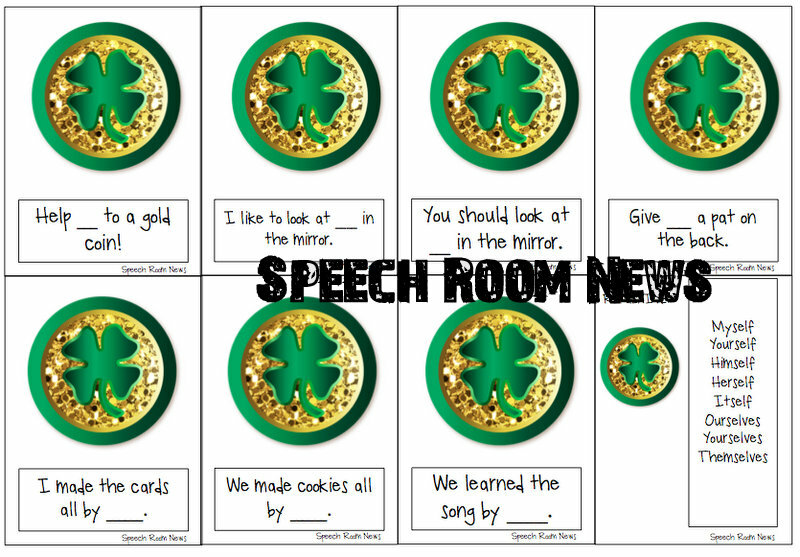 Gold Coins: Pronouns (60 cards) Fill in the blanks with the correct pronoun. Collect gold coins on your pot of gold! 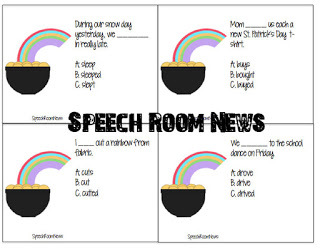 Over the Rainbow: Irregular Verb Cards (20 cards) Each card contains a sentence. Students must choose the correct answer to fill in the blank. They may keep their card on the box of chocolates if they answer correctly. 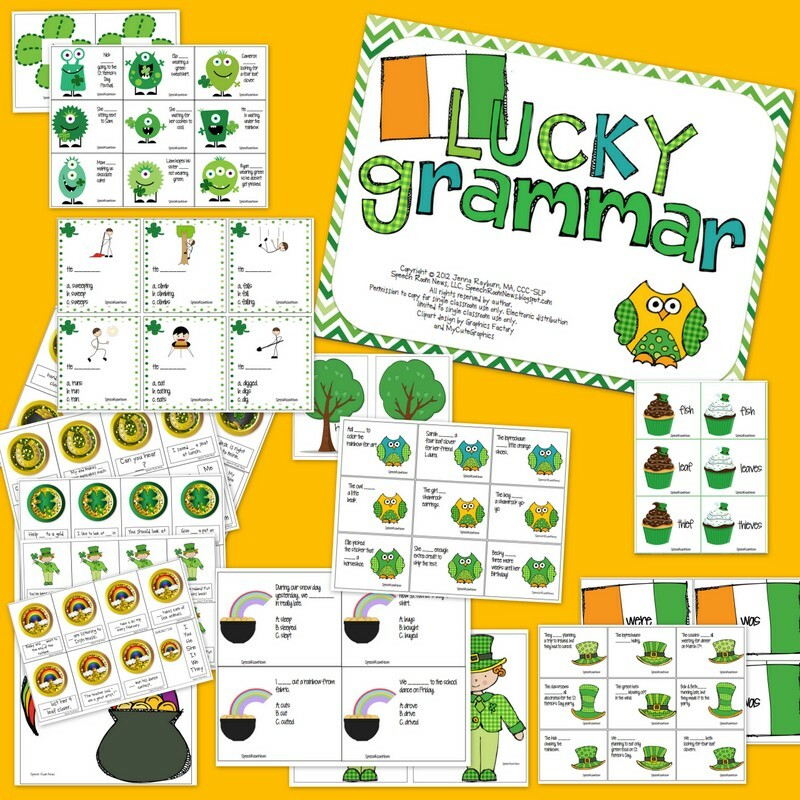 Sweet: Irregular Plurals (24 cards) Students read each card. Find the cupcakes that match. Develop a sentence for each. 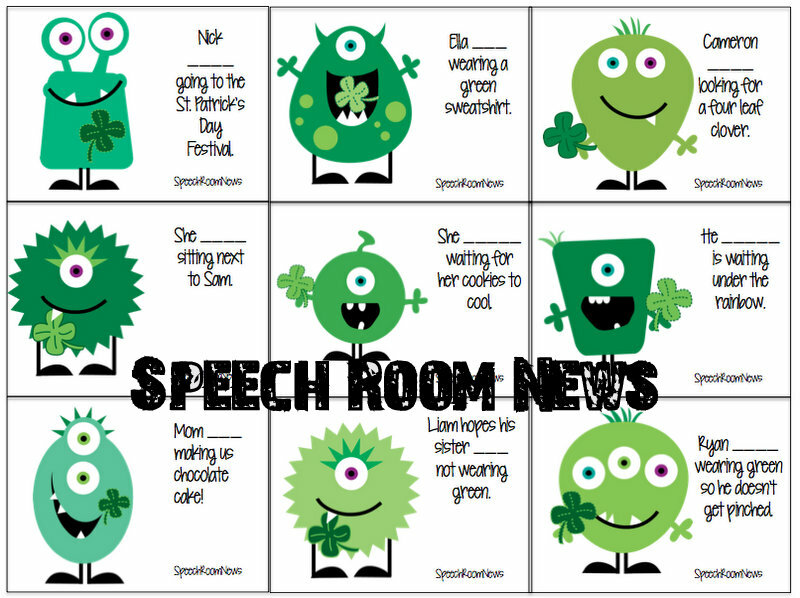 March Monsters: IS/ARE(18 cards) Students read the sentences and fill in the blanks with is/are. Sort the St. Patrick’s Day Monsters. 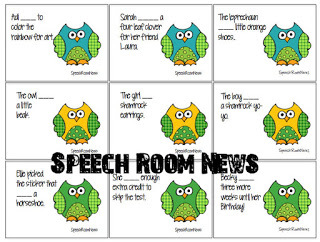 Hoot Hoot: HAVE/HAS Cards (18 cards) Students read the sentence on the card and fill in the blank with HAVE or HAS. Then sort the owls onto the right tree. 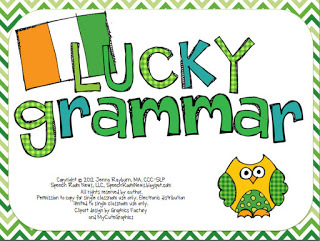 Irish Style: WAS/WERE cards (18 cards) Students draw a card. 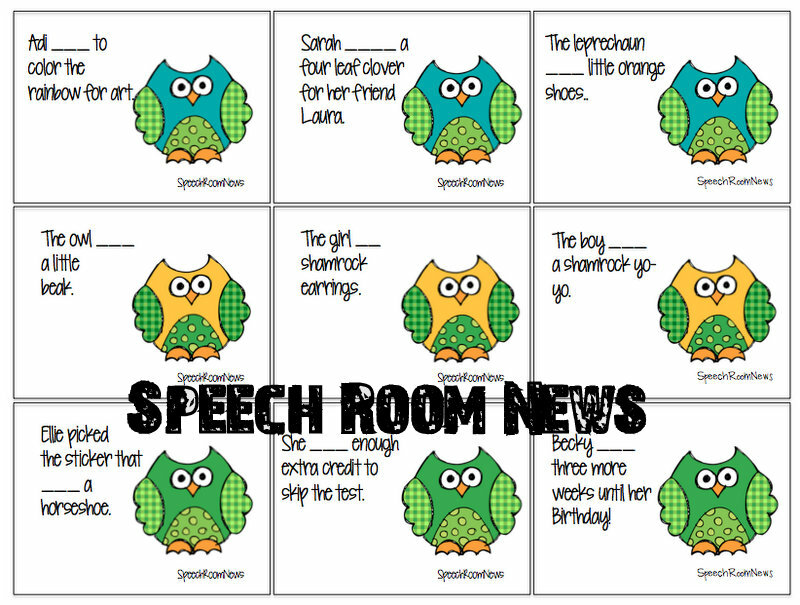 Read the sentence and fill in the blank with the correct past tense form of ‘to be.’ Sort the card onto the flag. 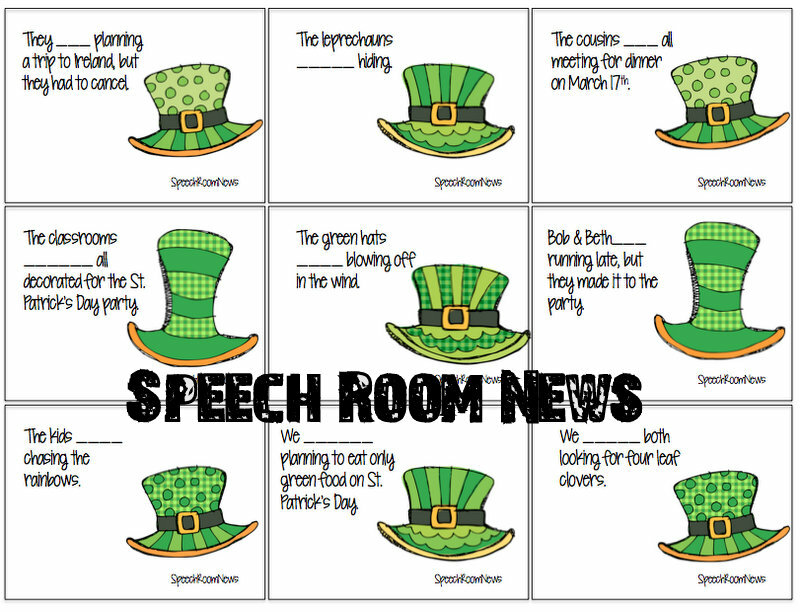 Lucky Lou: 3rd Person Singular: (18 Cards) Students help Lou figure out how to finish each sentence! Based on your feedback from other activities, I’ve also included 13 pages of homework activities. 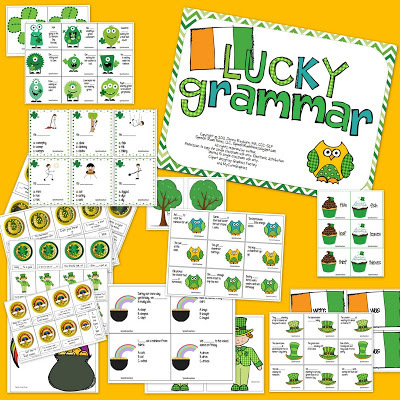 These extension activities cover each grammar target covered. Grab this download on my TPT Store! Leave a comment and I’ll pick one random person to win a copy! My students would love this!!! I love how you are always looking ahead to the next holiday and sharing your creativity! Oh Jenna…I have so many 2nd graders that I could use this with! Thnanks so much for making it! I love the variety of activities that you have included. Love this! I don’t have activities for March yet! This is so cute! I would love to use this with my students! Another super cute pack! LOVE the addition of homework sheets to this one! I have lots of kids working on grammar! I would love this! These are great, much needed activities! I’m excited that there are homework pages included!!! Homework pages…you just made my day! Excellent work as always Jenna! Love that you have included homework sheets with the pack. My students are always asking for homework and they would totally enjoy it! I love the addition of homework sheets, very clever. I love cute monsters too! Thanks Jenna! I love this activity, though I am sure I will be furiously laminating at the last minute, as well. I have a whole bunch of kiddos working on grammar right now! These materials would be perfect – and fun! Thanks for sharing your talent and time! Always love your stuff! Such an awesome activity. I can build it into writing lessons and using our imagination about leprachauns. I have a ton of kids on my caseload that are only motivated by new activites. Honestly, after two sessions with materials they are done. This is fabulous!!! I know my Homeschool co-op class would love this!! Homework sheets sound great! Thanks for the giveaway! You put together a great packet as usual. This makes grammar fun! This is a great activity! I have students who just don’t get grammar and instead of doing boring worksheets, this offers a fun way to work on their grammar goals! Thanks for another great packet! You make the best materials, I use each them everyday. Thanks for all you do and the great materials! Love building my material stash with yours. I LOVE this packet!!! 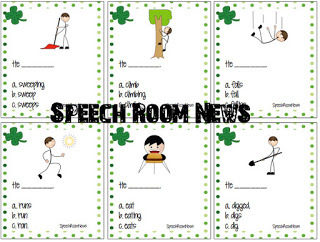 Have so many kiddos drilling grammar! Would love to win! Looks like a great activity packet. Can NEVER have enough grammar actitivites! I am totally in love with monsters right now! 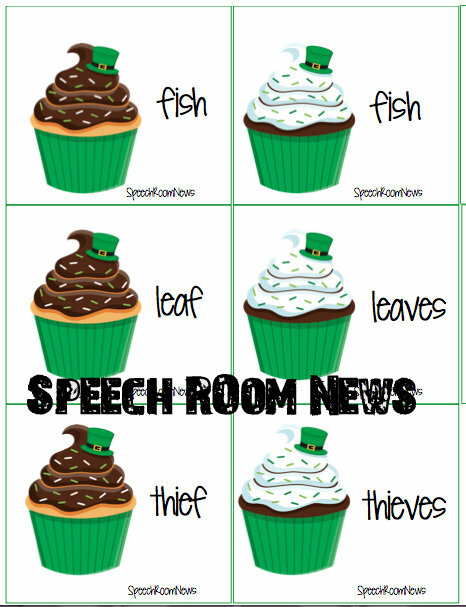 They are the theme for my speech room! Also, Homework— YAY!!! love the theme! it makes our sessions so much more appealing for the kids! Love your theme! & always need more grammar! Looks like an awesome packet. Hope I win. Just a helpful tip in case you haven’t heard it already, the monster in the preview who is in the second row all the way to the right needs to be fixed (you have the “is” in there). My daughter could benefit from these! I love the holiday themed activities. My kiddos get really bored if I just try to pull out worksheets (not to mention I find them boring too). I love playing the games with them and they like playing (and don’t realize that they are actually learning at the same time). Super cute! Love the monsters! Great goals to address! Congrats! You’re my random winner! 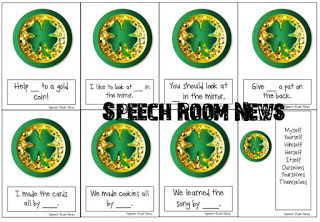 Email me at SpeechRoomNews@gmail.om to claim Lucky Grammar! Love it! I plan on doing the idea you posted last year about the gold coins in the pots to display again. The kids loved it! These would be a great addition. So many cute ideas that revolve around St. Patrick’s day. Adding to my wishlist. This is so cute. I especially love the little monster cards! so awesome! Love your blog and all of your materials-thanks so much! I wish that I was as creative as you are! I love your things and would love to use this with my kids! I visit your blog at least 5 times a week. Thank you for your ideas and inspiration! Another great one!! How do you find the time?? Green paradise. I am impressed with the activity. The cupcakes look better than pics. Thanks Jenna for sharing this! The kids love the activities because they are fun…I love them because they make my life easier! Where do you get your graphics? Always looking for kid friedly visuals to use within therapy. I would also love to know what you use for graphics. Jenna, I also have a TON of grammar kids on my caseload…Your activities directly match up with a lot of their IEP goals. I would love to win a free packet!!! I also have loads of students with poor grammar skills. What a wonderful packet! You always know what is needed. Thanks! I love this! I am student teaching and am planning to use this with my fifth graders because grammar is usually so boring. This will make it fun!